Easter Crafts are a lot of fun! There is such a variety of things you can do to make Easter seem a little more special no matter what your age. I like to even buy little Easter crafts for my Sunday School class to assemble on Easter morning. For less than 10 dollars I can usually get enough little craft kits for my whole class. Maybe you'd like to make something to dress up your home. 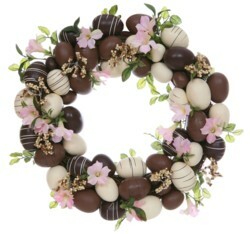 How about a chocolate Easter egg wreath? You can get the wreath frame at a local craft store, or perhaps Walmart. They come in foam, wicker, and grape vine. Depending on where you shop, you may even find other options. With a bit of ribbon, flowers, wire, and some chocolate Easter eggs, you can weave an adorable wall hanging that will be a temptation for the whole family. If you prefer, you can choose to use craft eggs instead of real chocolate. In that case, you can store your wreath in tissue paper and use it year after year. If you are looking for an Easter craft idea that you can make with the kids for them to give to others, why not consider making molded chocolates? Some of the molds are even for lollipops or pretzels, so you can really be creative and have some fun. You'll need to choose the molds you like as well as the chocolate for melting. You can always use chocolate chips if you want, but they have some lovely colored melts that you can use if you want to "paint" in the details of your designs. Great fun! Know what else they have? Kits! If you aren't sure what you need exactly, or you don't want to take the time to browse and choose (although I find that to be half the fun) you can just pick up a kit and you are ready to go. 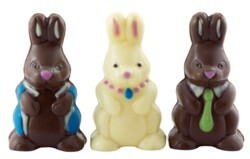 Believe it or not, chocolate molds are very inexpensive (about $1.99), and kits can be purchased for as little as $10.00. For something a little different, you may want to try the "Bunny Hutch." It's a pre-baked and assembled cookie house that you and the kids can decorated with the icing and candy provided. I hope you will enjoy making one or more of these ideas for Easter crafts. If you've come up with another craft idea to add to the list, or you want to show off your finished project, just use the handy form to "show and tell." I can't wait to see what you've done!